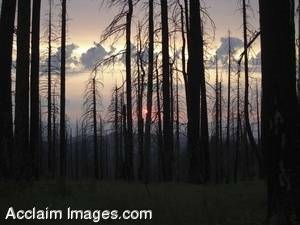 Description: Stock Photo of a Fire Damaged Forest. This picture was taken on top of Grizzly Peak in Southern Oregon near Ashland. The fire itself took place a few years back. You can now see the starting growth of new life. You may purchased this photo as a poster or an art print. You may also license it as stock photography.